Dormant sprays are important for management of a wide range of pests including European red mite, woolly apple aphid, rosy and green apple aphids, and San Jose Scale. Most of these are easily controlled using a variety of materials, but if you are using oils, remember that good coverage is essential because they work by covering the egg stage and preventing respiration. Which Leafroller Species is in Your Orchard? 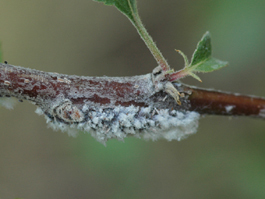 There are two leafrollers commonly found in Washington orchards: Pandemis leafroller (PLR) and Obliquebanded leafroller (OBLR). The phenology of the two species is quite different and you need to be sure which species you have for proper management and use the correct model on DAS. PLR used to be more common, but in the past 10 years, OBLR has displaced PLR from many of the production areas. Pandemis leafroller (PLR) and oblique-banded leafroller (OBLR) have different phenologies which are well documented on DAS. Delayed dormant sprays can work well for PLR, but are generally too early in the season for efficacy against larvae of OBLR. Taking the time to ensure that your sprayer is properly calibrated will insure best control of pests and diseases and save time and money. 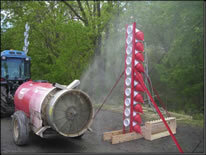 Proper calibration of an airblast sprayer requires that tractor speed, water volume, and nozzle manifold arrangement be coordinated to achieve the best coverage under site-specific operating conditions. Driving too fast is the most common error made in airblast sprayer calibration. Spray drift is one of the most important issues facing pesticide applicators. Movement to off-site locations can be caused by wind, poor calibration/adjustment, and operator error.